Bel Canto is inspired by the crisis in Lima, Peru, where on December 16, 1996, the Túpac Amaru Revolutionary Movement took nearly 500 people hostage in the Japanese embassy and held 72 for more than four months. The hostages, of many nationalities, had been attending a party. Sung in multiple languages – Spanish, English, Japanese, Russian, German, French, Latin and Quechua — the native language of the Andes — the opera, like the fiction novel, focuses on the relationships between the revolutionaries and hostages, as well as their common enchantment with the voice of hostage Roxanne Coss, an American opera singer. Soprano Danielle de Niese will perform the role of Coss. The opera’s premiere in Chicago is on select dates December 7 – 12 and January 5 – 17. Great Performances has announced it will present the opera in a national PBS broadcast as part of its 43rd season. 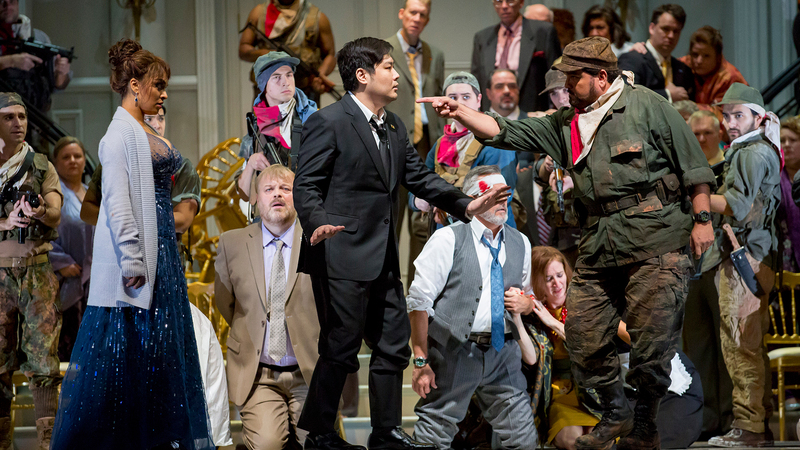 The most high profile prior effort to dramatize terrorism in contemporary opera has proven to be extremely controversial. The American opera The Death of Klinghoffer (1991), based on the Palestine Liberation Front’s hijacking of the Achille Lauro cruise ship and murder of the Jewish-American passenger Leon Klinghoffer in 1985, has caused protests in nearly every year and location of its performances, and quite dramatically so when the Metropolitan Opera in New York City finally premiered its production in 2014. That opera was conceived by director Peter Sellers and features a widely acclaimed score and has music by John Adams and libretto by Alice Goodman. The real-life circumstances behind Bel Canto are very familiar to its composer, Jimmy López. Born and raised in Lima, Peru, he was 18 years old during the hostage crisis the opera depicts. The Túpac Amaru Revolutionary Movement (MRTA), a Marxist rebel group, is likely a distant memory to American audiences, but this week, news about the American woman most publicly linked to it brought history to light again. On Wednesday, Lori Berensen completed her 20-year sentence for plotting with MRTA to seize Peru’s Congress and take legislators hostage. She left Lima that day to return to the United States. In the New York Times report on her release, it cites that in the 1980s and 1990s, clashes in Peru between MRTA and a competing rebel group, The Shining Path, claimed 70,000 lives. Learn more about Bel Canto on the The Lyric Opera site, which offers a synopsis and various guides. A teaser of rehearsal and set designs are in the video, below.